You can use Apple Watch as a remote control for your Apple TV when you’re connected to the same Wi-Fi network. Pair Apple Watch with Apple TV. If your iPhone has never joined the Wi-Fi network that Apple TV is on, join it now. 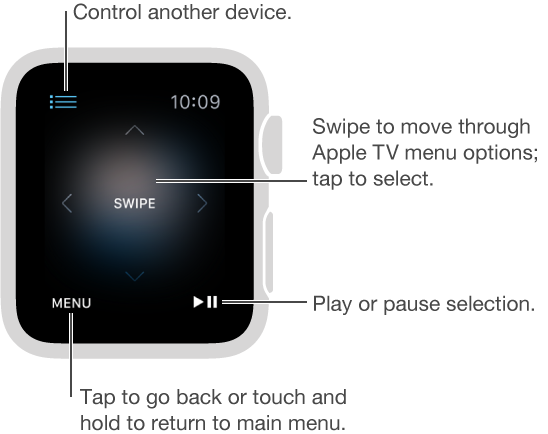 Then, open the Remote app on Apple Watch and tap Add Device. On your Apple TV, go to Settings > General > Remotes, select your Apple Watch, then enter the passcode displayed on Apple Watch. When the pairing icon appears next to Apple Watch, it’s ready to control Apple TV. Control Apple TV. Make sure Apple TV is awake. Open the Remote app on Apple Watch, choose Apple TV, then swipe up, down, left, or right to move through Apple TV menu options. Tap to choose the selected item. Tap the Menu button to go back, or touch and hold it to return to the top menu. Tap the Play/Pause button to pause or resume playback. Unpair and remove Apple TV. On your Apple TV, go to Settings > General > Remotes, then select your Apple Watch under iOS Remotes to remove it. Then, open the Remote app on Apple Watch and, when the “lost connection” message appears, tap Remove.